The garden is in full swing despite it being early October. 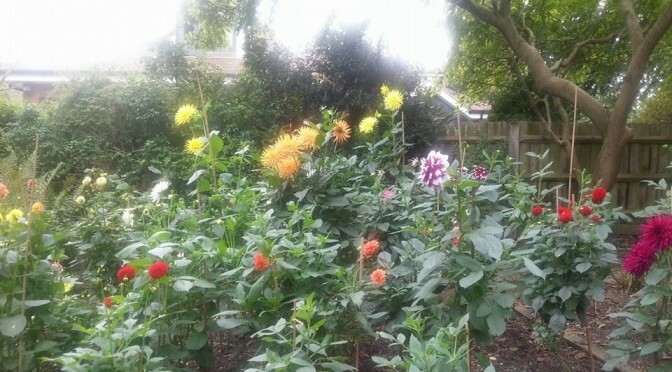 Looking towards the left fence across my little Dahlia farm. On the other side of this fence was the horse paddock, later a tennis court, and now a house. Many of the trees and shrubs this side of the fence are past their best and are coming down. So something else will need to take their place to get some privacy. I am not a big fan of Leylandii or Laurel so the thinking cap is firmly on. Due to one thing or another, I planted the Dahlias out quite late and they are only really getting into full swing at this point. So just counting myself lucky that climate change seems to be keeping the Dahlias as well as the parakeets happy.